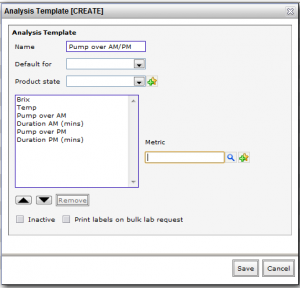 Create an analysis template which contains the appropriate metrics for pump-overs/punch-downs. Find the set of fermenting wines that will go through cap management until they are barreled down. Create lab request jobs and send the PDF to the cellar to have the work performed. Head into Winery Setup > Production > Analysis Templates. Add a template for each different regime you have. This can be a combination of analysis metrics (e.g. Brix and Temp) and cap management techniques (e.g. punch down, pump-over, etc., set up as dummy metrics in the system). The technique dummy metrics should be simple Yes/No metrics. You can also include some dummy metrics to include duration information (these can just be set up as Units). These will print as columns on a worksheet for your cellar staff. It is important here to leave the Print labels on bulk lab request option unchecked. 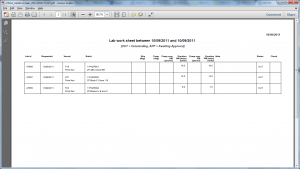 No need to print lab labels when you generate a cap management worksheet for the day. To generate a worksheet for the day, you just need to generate lab requests using this template from the Bulk wine search (Search > Advanced Searches > Bulk wine search). For general information on using the Bulk wine search, click here. For instance, you may be looking to produce a worksheet for all fermenting reds for a certain client. Use the filters and search criteria to find your wines and click Search to display them. Select all the wines (use the checkbox to the left of Status) or select only the ones you want by ticking the individual batches. 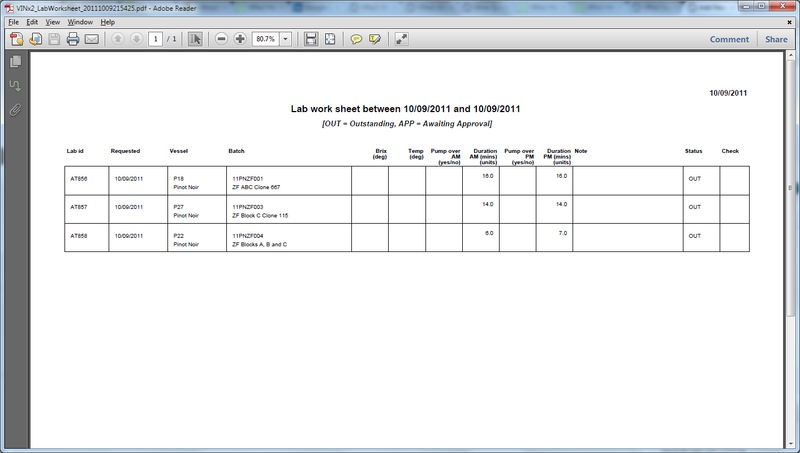 Click Actions and select Lab work. This will open the Lab request dialog box using the Pump Over AM/PM template – this will set up a separate lab request for each of the wines selected. Head into your Lab Console (Consoles > Lab). 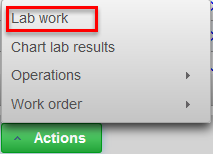 Select the template from the drop down list; the requested lab jobs we created above for each tank will display. 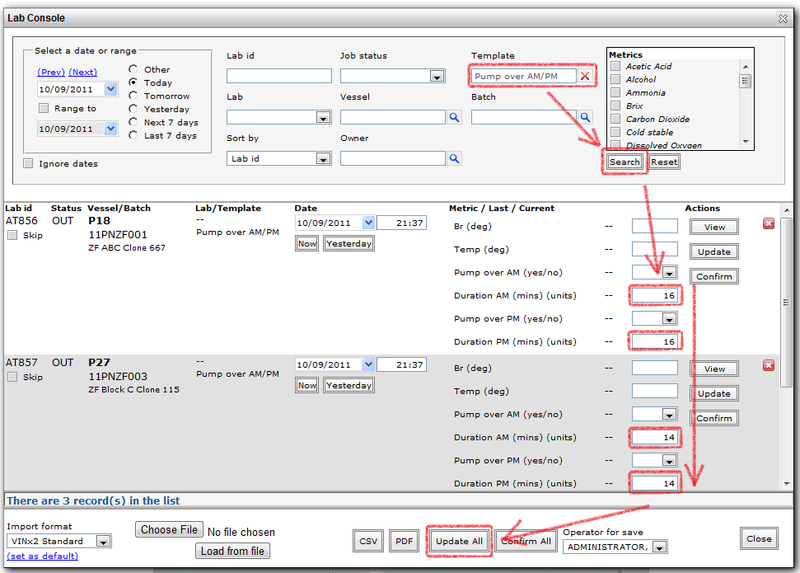 If you are supplying the cellar staff with duration instructions, fill in the duration amounts out for each tank, then click Actions > Update All. When the worksheet comes back from the cellar with Brix/Temp and whether the pump-overs/punch-downs were completed, you just need to go back into the Lab console, bring up the template and date that matches the worksheet, and fill in the gaps (Brix/Temp readings, duration (in units = minutes) and select Yes/No if the pump-over/punch-down was performed). Note that once a batch has had this cap management lab performed, the previous day’s duration and brix/temp values, etc., will be visible next to each tank in the lab console which should make it easy to see how values have changed, etc.